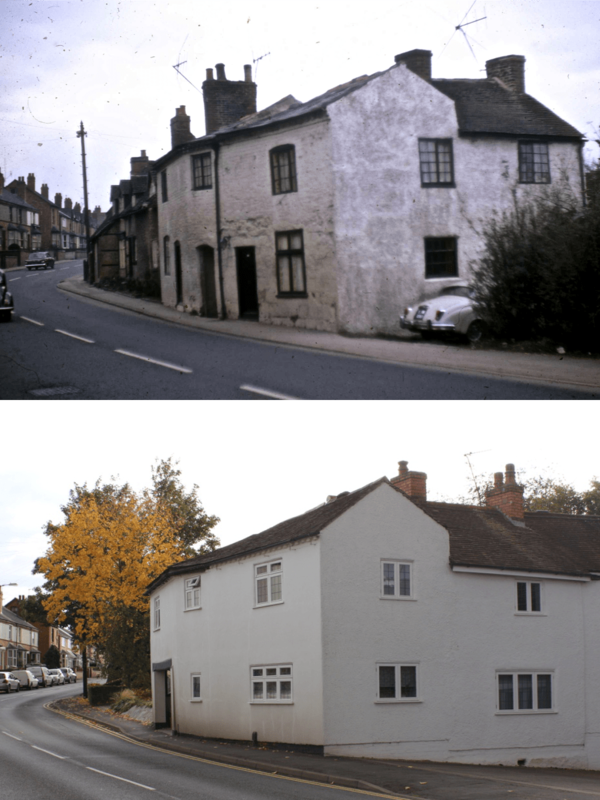 This property, which hugs the bend of Clinton Lane opposite the entrance to Avenue Road, was once an inn. As Robin Leach records on his Victorian Kenilworth website it was once known as the Drovers Inn, having been used by Welsh drovers, although further dates and details of the pub itself are hard to come by. According to the Local Drove Roads website, it doubled as a turnpike and hence drovers are said to have dodged behind the row of buildings to avoid the tolls. Clinton Lane once formed a link in the great chain that was The Welsh Road; a drovers road used to drive cattle from as far away as the rich soils of Anglesey over 250 miles to wealthy customers at market in the South East. Drovers and their herds would follow the line of Watling Street from Shrewsbury and over Cannock Chase to Brownhills, from where the Welsh Road ran through Stonnall, Castle Bromwich, Stonebridge, Kenilworth, Cubbington, Offchurch, Southam, Priors Hardwick, Boddington, Culworth, Sulgrave, Syresham, Biddlesden, and Buckingham. This means that the Welsh Road followed the line of the modern A452 as it departed from the A5 Watling Street near Brownhills, along a stretch known today as the Chester Road, before entering Kenilworth down Clinton Lane and passing out the other side over Chesford Bridge, where a ford has existed since ancient times with probable Roman connotations, and up Bericote Road. References to the name Welsh Road can still be found along the way. South of Kenilworth, the 20 mile stretch between Cubbington and the bridge over the River Cherwell near Culworth is still called Welsh Road and Welsh Road East. Further north, a modern development in Balsall Common has also assumed the name Welsh Road. According to the Our Warwickshire website the Welsh Road’s usage as a drover’s road would have dated to way back before the Elizabethan era, when the castle was very much still occupied. So, the question of which route it took through Kenilworth is an interesting one. The direct route from the Drovers Inn on Clinton lane would be straight through the castle’s gatehouse and through outer ward of Kenilworth Castle, out through Mortimer’s Tower over the Tiltyard, via the The Brays and then onwards down Warwick Road towards Chesford Bridge. The modern route through Castle Road via the ford wouldn’t have existed for much of the period when the Welsh Road was in operation as the area was flooded as part of the castle moat. But if the route through the castle’s outer ward itself wasn’t permitted, then which route did the drovers and their cattle take? Perhaps drovers went via the long since lost pack horse bridge that once stood next to the modern day swimming pool? Alternatively, resistivity work in the Abbey Fields shows that there was almost certainly a ford immediately west of Town Bridge, which would have been an ancient route. Fieldgate Lane/Beehive Hill linked the northern Welsh Road to this ford and its southern continuation. The 250 mile journey down the Welsh Road had to be undertaken in stages of 12-15 miles a day, taking three weeks to complete. By 1810 number of cattle being driven out of Anglesey had risen to over 14,000, so just imagine for a moment having potentially thousands of cattle wending their way through the very centre of Kenilworth every year! Behind the Inn in the mid 1960s ‘then’ photo can be seen the old timber-framed and sandstone cottages of 81 – 83 Clinton Lane before their demolition, presumably for a road widening scheme that evidently never happened. The former Drovers Inn somehow escaped this fate.